Todd in the Shadows is right. Forgotten Years was the superior Midnight Oil song over Beds by most measures, although I preferred Blue Sky Mine. I adored this whole album in my 20s. I continue to be fascinated by the intersections between high-end simulation and historical recreation. I recently visited the Mariner's Museum in Newport News, Virginia where they are restoring the pieces of USS Monitor and watched their excellent multimedia retelling of the 1862 Hampton Roads battle, part of a truly amazing and informative exhibit. Highly recommended if you're ever down that way. A Monitor fact I did not know until my visit: in its epic drawn battle with CSS Virginia, stopping the newfangled turret's rotation in battle accurately proved too difficult, so they just let the steam engines turning the "cheese box" constantly rotate it, and fired "on the fly". This constant movement in turn made it impossible for the Virginia crew to get their own shells into their gun embrasures, the Monitor's only weak spot. Seriously, why has there never been a movie about Hampton Roads? The stories write themselves, with a raft of tragic endings to pick from: the Virginia being burned, the Monitor sinking in a storm, etc. In similar vein, the use of the Total War game engine to create an explanatory film for the Oxford Ashmolean's exhibit of recent archaeological finds off Sicily by Creative Assembly, as shown in a Youtube clip this week, is just nifty. If an election campaign spent all of its effort attacking the opposition and none figuring out which districts were undecided, which were most worthy of competing for, and what specific messages were necessary to sway them, the campaign would be destined to fail. No serious contender for the American presidency ever confined himself or herself solely to the “strategic” level of a campaign, telling the staff to worry only about the national and regional picture and to leave individual counties and election districts entirely in the hands of local party organizers, disconnected from the overall direction of the campaign. * Footnote #13, if you wanted to know. All props to Movie Bob, who explains well why The Killing Joke didn't work as an animated movie, but here's one addendum I have to make as a fan of the book from way back. The problem isn't that they do 30 minutes of putting Batgirl in context before Joker shoots her to start the main plot. That had to be done. The problem was they made that prelude a story about Batgirl's relationship with Batman, when the Killing Joke is less about how her crippling injury affects Batman and how it affects Gordon. The movie would have worked soooo much better if those first 30 minutes had been about a Barbara Gordon-Commissioner Gordon conflict, possibly one that has her giving up The Cape (tm), but definitely one that brought them closer together as father and daughter. And then, *boom*, she's shot, and Gordon goes to pieces, and the rest of the piece flows from there. One change, could have been a good movie. They had everything else they needed, Conroy, Hamill, a good 2nd and 3rd act. Maybe it didn't need to be made, which was Bob's point, but still, missed opportunity. 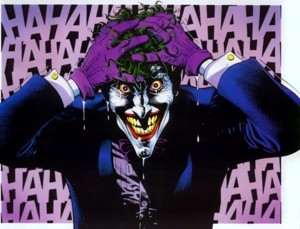 Oh, and while Doug Walker apologizes at the end here for thinking that the end panel possibly indicated the death of the Joker, which the movie disavows... as far as I knew that was left ambiguous deliberately and that his was a perfectly valid reading... one which um, yeah, the movie would also have done better by not "clarifying." The beauty was you never knew if this was how Joker died, or not. It was a multiple choice ending, as Joker would have said, and there was no reason in the movie to straighten that out. Yes, this week's TaySway-Trent Reznor mashup is pretty inspired, right up there with Nirvana-Astley. The best of all time, though, is still Aha-Ozzy. Headline in Globe and Mail tonight: "Man who owned python that killed two boys arrested"
Free prediction... the Campbellton python's a patsy, always was. This was obvious to any thinking person from day one. The daily press are bound to catch up and connect the dots and stop writing such silly headlines any day now. Ottawa today: what was the evidence for two shooters? Horrible tragedy in Ottawa. All thoughts and prayers to the family of Cpl. Cirillo. There was a lot of confusion in this case about multiple shooters, and often times that's just panic, but in this case this was perfectly understandable, with two shootings hundreds of metres away in under six minutes. First response to the Memorial shooting was recorded in multiple locations at 0952h. CBC's video of the supposed shooter getting into a plates-free car pointed east on the road immediately north of the memorial is almost exactly at 0952. Globe reporter Josh Wingrove's first eyewitness tweet reporting shooting was at 0954h. The fusillade that killed the individual, according to Wingrove's subsequent tweets' timestamps, was likely at 0956h or earlier. It would seem hard to just cross that distance in 2 minutes, let alone spark a fatal police response in 4. Assuming no errors in the time stamps, and the guy captured in the dashcam footage was the lone gunman here, that would mean the guy U-turned his vehicle around on Wellington Street's heavy traffic, jumping a raised median, before parking on the other side of the street 100m away from where he started, got out, having reloaded in there somewhere, got over or through the security bollards, and then, according to witnesses, hijacked another car to drive 250m across the grounds before getting out and bursting into Center Block through the front door. In 120 seconds. In the absence of conflicting evidence, that's the kind of timeline that makes it hard to see why one couldnt conclusively rule out two shooters early in the day. It also really shows the lethality and effectiveness of the security response here. It really couldn't have been any faster to react. The giveaway that it was only one shooter was likely the car the fellow gets into in the CBC video, which does look very much like this Toyota, which was identified as a shooter car in front of Parliament on Wellington within half an hour of the shooting. That car's location is right in front of the Parliament Hill vehicle gate, almost exactly 100m up the road from where the dashcam car was parked (note the white rectangle, rear window, top right), but facing in the other direction (west). One can assume police had access to better camera footage that allowed them to track the shooter's movements and ascertain it was in fact the same fellow. It also no doubt helped wrap up the situation quickly that the shooter declared his intentions so obviously upon getting into Parliament. video of the takedown? That's the sound of one long gun, likely a shotgun, echoing, followed by a fusillade of pistol shots. You don't have to be a forensic specialist to identify that as the intruder opening fire on police and getting immediately cut down by multiple handguns. No demands, no negotiation, nothing. He must have started firing the moment he saw a uniform down the hall. The Hill police were lucky that first shot was essentially a miss, and that shotguns don't have much of a range advantage over pistols. Bill O'Reilly thinks the problems of the world can be solved by creating an elite corps of ninjas. Surely I don't have to explain why this is a bad bad idea. I was taught to pronounce it "ATT-ila"
Personal opinion: with a year of fixes now behind it, Total War: Rome II is the best game yet in the Total War computer game series and an absolute pleasure to play. 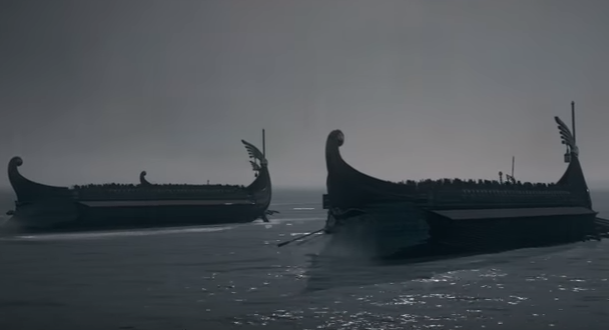 The newly announced Total War: Attila looks very promising, too. With the latest tweaks to slow down the battles just enough to tease out the strategy, it's become, even more than its predecessors in the series, a kind of militarized real-time chess, with intricate play at the highest levels, yet play that is grounded in a historical realism that no other RTS game has ever really matched. The single-player campaign vs the computer is very good, too, and the co-op campaign for two-player teams is a big improvement over its Shogun 2 and Napoleon predecessors if you happen to like that sort of thing. Also, the mod support via Steam for amateurs wishing to tweak things is the best I've ever seen for a computer game of this complexity, ever. Easy to create, easy to update, easy to share. Yes, the provided game music is still god-awful, but the mod to swap that out with the original Rome:Total War score was a five-second install, solving my last real complaint with the game. If you ever wanted to see TW:R2 played at the highest level and get what all the fuss is about, and maybe pick up some insights on how ancient fighting really worked, too, you really should watch Heir of Carthage's battle replays against other opponents on YouTube (any of the ones that say "Country X" vs "Country Y" at the top). The guy's got an OODA loop you could wrap around your pinky finger, and unlike most replays, explains his thinking in great depth, and with a chivalrous respect for opponents you rarely see, too. Top class. Leonard Cohen turned 80 on the weekend. Many happy returns to a Canadian and international treasure. 1) As Rachel Maddow has identified, the NATO head's briefing on the area from the end of June specifically referred to vehicle-mounted heavy AA missile systems being on both sides of the Russian border in the vicinity of the crash with evidence of Russians actively conducting training on those systems within Russia. The implication is, of course, that these were Ukrainian separatist fighters being trained, on the specific missile system in question, the SA-11 or Buk. 2) Russia's own civilian airspace authorities acted to stop civilian flights in Russian airspace close to the disputed area earlier the same day, as the New York Times has reported. Now I'm inclined to think the timing of the latter was a coincidence, that the Russians took a couple days to draw the obvious conclusions that if a rebel force was taking down Ukrainian planes at airliner heights, it was past time to close civilian airways at all altitudes running through the same area. But it again, along with the first information, raises the question why Ukrainian civil aviation authorities did not act much earlier here, and why the international airline risk community was not acting much more promptly as a whole. Simply put, Ukraine had all the necessary information to stop this. They closed part of their airspace, but only up to an altitude that wouldn't inconvenience anyone, even though their military authorities had to have known that the same missile that took down their transport plane 3 days before almost certainly had the capability to take down any airliner above that altitude as well. It does not speak to a government functioning at a high level or with a strong sense of its international responsibilities. Of course, compared to the Russians here, they're still looking like the more responsible, aggrieved party in all this, as they should. There is no doubt in my mind that Russia and its proxy fighters in Ukraine deserve all the blame here. But these were still avoidable deaths if some combination of Ukrainian and international aviation authorities and the airline itself, had been more on the ball. I will also say that the pro-Russia pushback in all the comments sections of all major news outlets' stories on this has been remarkable the last couple of days, way more than one would expect from disorganized first- and second-gen Russian immigrant communities. That an organized push of a pro-Russian counternarratives is partly responsible for that seems highly likely. There's only one thing you really need to know about the tragic loss of a Malaysian 777 airliner over Ukrainian territory today and that's this. No civilian plane has ever been shot down before at modern day cruising altitudes, other than in mistaken attacks by state actors. There is no system readily available to any non-state armed force that can hit a plane at these altitudes. When insurgents and guerrillas have attacked planes, it has invariably been on takeoff or approach to landing, when the plane is near to the ground and within the range of man-portable air defence missiles (aka MANPADs), mostly with infrared guidance, that can home in on a jet engine from a few thousand metres away, vertically or horizontally, at most. Were a man-portable missile to hit a jetliner in such circumstances, from that kind of close-to-tarmac firing point, it would tend to explode at a distance dictated by its built-in proximity fuze, shredding the one engine and potentially damaging other components. While obviously extremely dangerous, in most historical cases multi-engine aircraft crews have reacted to the engine loss and brought the plane out of danger in at least a semi-controlled manner. They almost certainly would have time to communicate, which was not the case here. This is not what this shootdown today was, at all. This plane was destroyed at high altitude, by a massive explosion. Any missile that can do that, like the SA-11 Buk apparently used here is large, and radar-guided: meaning significant infrastructure and a trained team is required for its use. Whereas a standard shoulder launched missile has a 1kg explosive warhead, the SA-11 has a 70 kg warhead, capable of taking any plane out of the sky completely with one accurate hit, at any altitude. An SA-11 launcher/radar (TELAR) vehicle is mobile, in the sense a tank is mobile: a tracked vehicle weighing over 24 tons. It's huge. The missiles are telephone poles: 18 feet long. This is what this rebel group was using to strike first a Ukrainian transport 3 days ago and now this unfortunate jet. I don't doubt the rebels in this case committed an immense error, as they tried to keep the air above them clear of the Ukrainian military planes that have been beating up on them pretty badly lately. (Russia's increasing attempts to impose some kind of no-fly zone over Ukraine to help them, shooting down a Ukrainian ground attack jet this week, are the other way Ukraine is being challenged in the air right now.) The very fact this happened at all indicates their crews weren't particularly well-versed in airspace control and defense the way a real anti-aircraft detachment would be... which suggests this was probably some poorly trained yahoos on stolen or loaned gear, not an organized Russian unit. Which leads one to conclude that civil aviation authorities really dropped the ball here. Because the Ukrainians reported the loss of a military transport to surface-to-air fire three days ago in the same area, flying at the same civil aviation altitudes (6,500m in this story). That should have led to an immediate reassessment by all airlines and agencies of the threat here. A kill at 6,500m is not achievable with insurgent-type weapons: it meant a radar guided system, professional military-grade, right there. Which meant it was highly likely 3 days ago someone in that area, not responding to any clear national chain of command, had a system capable of shooting down airliners and was actively using it to deny that airspace. It was the smoking gun/red phone moment for any airline intelligence analyst and they all apparently failed to raise any kind of alarm anywhere near quickly enough. All adverse military effects are going to be called "intelligence failures" by somebody. Comes with the trade. But this was a Challenger-shuttle level example of cross-institutional inability to react to new and changing information. Absolutely, blame the Ukrainian rebels. But save a little blame for Ukraine, who should have stated more strongly that, given the threat 3 days ago, all planes flying in that area were now in jeopardy and should be diverted around the area, and for the airline officials who put an incredible number of lives at risk by failing to respond appropriately and promptly to one of the most obvious threat warnings they were ever likely to see. Someone needed to be screaming from the rooftops on Monday that a major international air route was seriously jeopardized this week, and someone in Malaysian Airlines needed to have been listening. What the hell, ICAO? What the hell, FAA? WTF, EASA? The fact Fallows can't find a relevant FAA warning for the actual Donetsk area (as opposed to the Crimea ones he did find) even before the Ukrainian transport was shot down, let alone after, despite repeated attempts to help from commenters, is indicative here: no one picked up on this particular alarm bell. For the last 50 years of air travel, airliners have benefited from being too high to be affected by ground battles. So long as they obeyed the wishes of governments that wished you to stay out of an area and state-on-state warzones where radar weapons and jet fighters were in play, and didn't land at airports with rebels at the end of the runway, they could always cruise serenely above the fray, along whatever rhumb line saved them the most time and money. It was that complacency that killed these people, almost as much as the rebel who pressed the launch button on a radar hit he probably didn't even really understand. See also David Cenciotti for a slightly different take. It's just appalling that Ukraine didn't immediately revise their altitude limitation on that airspace up from the 32,000 feet ceiling it was at this week. The way these things work, if you can kill at 20,000', you can kill at 40,000', or 60,000'. A 32,000' limit only makes sense if the defined threat is infrared shoulder launched infrared missiles, with a big, big margin of error (really, a kill at 10,000' with a man-portable missile would be nearly impossible). To fly planes at 33,000', right above that,indicated Malaysian Airlines understood that to be the most likely threat scenario, one that effectively had no impact on your flight financially because you would likely have been above that altitude in midflight anyway. If you have a current-technology vehicle-mounted radar-guided system like the Buk in play though, no altitude is too high, and diversion (and extra flight miles) is the only option. Which of course Ukraine got around to doing today. Appalling. Continue reading "The Ukraine airliner shootdown"
"But the fledgling Afghan state does not have the ability to pay for its own security forces, and countries such as Canada have an obligation to continue funding the unfinished war." I have no idea on what basis that obligation would rest, other than the principle of good money after bad. Continue reading "Sunk cost fallacy watch"
After Sy Hersh's ludicrous claim in LRB this month that the Turkish government's hitherto unheard-of and probably imaginary chemical weapons program was behind the April gas attack in Damascus, it's worth adding a ways-ago link to some further, actually compelling, chemical-analysis evidence that the Syrian military, for reasons still poorly understood, did actually gas residents of a capital city suburb with Sarin last August. "Hersh and LR were trolling for clicks" would be the most charitable explanation of their regurgitation now of the clearly false Russian government line on this issue. But it would not be totally crazy either to see the Hersh article as an information plant made with the intent of sowing doubt among NATO alliance member populations, where Turkey is both the weakest link in many ways and would be key terrain for any kind of future attempt by the Alliance to support Ukraine militarily. More on Hersh specifically from the same author here. The apparent first use of the new rockets was against Syrian rebels in Kafr Zita, who also this week convincingly reported a helicopter-delivered improvised chlorine gas munition was used against them by government forces. No fatalities this time (you're probably more likely to kill people by hitting them in the head if you're just going chuck gas cylinders out of transport helos), so it's unlikely this one will raise much of a fuss, nor should it, and the possibility of a rebel planting or blowing up of a gas cylinder on the ground near where the government's helo attack occurred certainly can't be totally ruled out yet, either. But the military futility of the attack in itself may indicate the Syrian military's chemical weapon deployment options truly have been significantly reduced from a year ago, which is a good thing for Syrian civilians. There's been a lot of discussion on this, with Sy Hersh weighing in recently, so it's time to revisit. Short story, Syrian government culpability still seems clear from here, but the evidence has taken some twists and turns that are worth commenting on (if only because my graphic several posts below now turns out to have been based on inaccurate UN reporting and would appear to have been disappointingly misleading). Below the fold is a detailed analysis of the recent findings on this, and why I would argue the preponderance of evidence still points at the Syrian army as the culprit. Continue reading "Apparently I wasn't done with Syria's chem attack yet"